How slippery is stone underfoot? Stone is no more slippery than other surfaces such as linoleum, wood or ceramics. However, stone can become slippery if the floor is both dirty and wet. We can apply an anti-slip coating to stone to increase slip resistance. What is honed marble and limestone and where can it be used? Marble, travertine and limestone that is ‘honed’ has a matte or satin finish rather than a high reflective polish. One feature of honed marble is that is does not show etching as readily, nor wear patterns on the floor. Some people prefer this because it has a less formal, softer appearance than polished stone. Our dog threw up and we did not discover it until the next morning. Is my floor ruined? Obviously, you’re not always at hand when accidents happen. This means that spills and other accidents sometimes lie on your surface for some time before they are cleaned up. So is all lost? Even if after cleaning there are dull spots left and the floor feels rough, it is unlikely your floor is ruined. This damage is called etching. Etching happens when some form of acid comes into contact with marble or limestone surfaces. The acid causes a chemical reaction that removes the polish or roughens the surface. The good new is that these dull spots and roughness can be removed with polishing! Get in touch today to see how we can help. Why has my marble floor lost its original appearance? It may be because of very heavy traffic or the use of harsh cleaners. Always use cleaners specifically designed for natural stone. An untreated dry dust mop is best for daily use, and wash with Stone Soap periodically. Our granite worktops really don’t look their best. Is it worth keeping them? It’s true that synthetic worktops are cheaper, and they may be a tempting option if you’re looking to replace or revamp an old kitchen. However, while acrylic and manufactured worktops may have the look of granite, their resistance to bacteria, heat, scratches and stains – in fact, their overall performance – isn’t a patch on granite. Marble with a honed finish can also make a high-quality kitchen worktop. I noticed some of my stone tiles seem to be raised slightly. I’m worried someone will trip. Can this be fixed? This sounds like a lippage problem. Lippage is a condition where the edges of the tiles or slabs are not at the same level as each other. This can be the result of installation problems, or from the floor settling. Removing this unevenness in your floor surface consists of grinding the high spots so that the floor becomes level. At P Mac, we use lippage removal discs to grind down the surfaces to reduce or even completely remove this lippage. Lippage removal can also eliminate some of your worst scratches and floor stains. All tile lippage should be removed before polishing your floor surface. How can I avoid damaging my stone flooring? The good news is that once your stone floor is sealed, it is very hard to damage! That’s why stone is such a great long-term flooring solution, unlike wooden flooring that can be easily scratched and marked. Can a stone floor really last a lifetime? If installed and cared for correctly, your stone floor should last for the lifetime of the house. Stone floors must be properly installed, sealed correctly and cleaned with the right products. For more information, take a look at our articles about caring for your natural stone floors. My new house has travertine tiles in the bathroom. Are they really suitable for a bathroom? Travertine is essentially hard water deposits in large enough quantities to quarry and cut into blocks, then tiles. It is made from water, so it is great in a wet environment. We would check to ensure you do not have any open holes or voids through the stone where water could go through. We would then treat the tiles and you should care for them the same as any other natural stone. For more information, take a look at our post on Travertine Floor Cleaning. Will a polished stone floor wear away quickly in heavy traffic areas? Polished stone floors can become dull with heavy foot traffic. Normal footwear does not cause the main damage, however. The sediment and grit that lie on the stone surface are the main enemy. 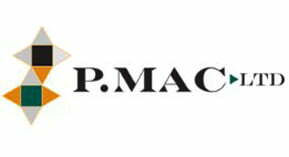 The floor should be kept clean as part of everyday maintenance and cleaned by a specialist such as P Mac whenever necessary. Why has my marble floor lost its original lustre even when I mop it using a floor cleaner? Many marble floor problems can be attributed to harsh cleaning. For everyday cleaning it is best to use an untreated, dry dust-mop. Never use spray or products that are designed for vinyl floors. These products will only make the floor dull in appearance and increase the need for other maintenance. We have a number of articles about good marble care on our blog. Can anything be done to remove a red wine stain without damaging my stone floor? Because natural stone is porous, it absorbs food and liquid readily. This will result in stains if the spillage is not cleaned up quickly. We can reverse the process by applying a poultice which will re-absorb the spill. The type of poultice varies depending on the type of floor and the type of spill. Feel free to get in touch to discuss how we can help with your stained floor. Is there a lot of dust when a stone floor is honed or polished? At P Mac, operatives uses a wet system when polishing or honing stone floors. This ensures that no dust is spread around the room. When the polishing or honing is completed, the floor will be ready to use. Dust is not a problem with P Mac! My tiled floor looks really worn out. Would it be easier to just rip it out and replace it? Replacing a floor can be expensive. The best thing to do is to let us assess your tiles, as they may return to their original glory with a professional clean and a quality sealer. If you decide to keep the floor, don’t forget the everyday maintenance with a dry dust-mop and periodical cleaning with Stone Soap. This will keep your floor looking its best for as long as possible. I often have fruit juice spillages on my stone kitchen floor. Can anything be done about the dull spots this has caused on the floor? All spills should be cleaned up straight away to help prevent staining. Fruit juices are particularly acidic and can remove the polish from the tiles, causing these dull spots. We would always recommend areas like this should be cleaned and polished. For more information, take a look at our article about cleaning natural stone. I have just painted my skirting boards, will they get damaged during cleaning? No. We take great care when working near edges of rooms and carry out all work within six inches of the edge by hand. Is it really necessary to seal stone? All stone, even granite, will absorb stains over time. It is important to use a penetrating sealer to prevent stains from oil, wine or other liquids from seeping into the surface. You should seal stone floors every year or two to prevent possible staining. What can happen if I don’t seal my natural stone tiles? If you do not seal your stone tiles, every time you spill a liquid it will seep into the stone and stain it. We highly recommend that you seal all natural stone tiles. Can I use granite for my kitchen worktops? Yes! Because granite is a hard stone that is formed at high temperatures deep in the earth, its polish is not subject to scratching by knives or pots and pans. It is unaffected by typical kitchen heat or spilled liquids. Is each piece of granite unique? Yes, granite is a natural stone and you will never see two pieces that look exactly the same. Is a natural stone floor practical with young children around? You’ll be glad to know that natural stone is a very practical flooring for young children. If they suffer from asthma or eczema, natural stone tiles are excellent, as they harbour far less dust than carpet. Your stone should have been sealed, so potty training is easier on you, just mop up any little accidents with a cloth. Almost any concrete floor can be polished, but there are some exceptions. We would not recommend polishing a concrete floor that had been tiled. This is because it’s impossible to remove tile adhesive without plucking the concrete. These plucks need repairing and will always be visible on your finished floor. Can you polish a concrete floor that has been covered in carpet or marmoleum? Yes, you can! Adhesive can be difficult to remove and will have seeped into the concrete, but this can be removed during the grinding process. Does my concrete floor need to be power floated? A new concrete floor needs to power floated in order to remove any air pockets that may occur during the pour. Concrete is an excellent conductor of heat, so a polished concrete floor is an excellent choice for underfloor heating. However, care should be taken when the heating is turned on for the first time – the temperature should be brought up very gradually over the first two weeks. Concrete is prone to cracking, however there are a number of preventative measures that can be taken to help reduce the risk. We advise using polypropylene fibres, not adding water to the mix and applying expansion joints and crack inducers. For more information about how to get a suitable floor for polishing, take a look at our tips in this post: Can any old concrete be polished? How much concrete is ground off when polishing my concrete floor? If opting for the bronze finish, we grind off the surface paste only up to a maximum of 1 mm. For the silver and platinum finished, we would grind off between 3 mm and 4 mm. What depth should the concrete be in order to polish it? You will need a concrete slab that’s at least 75 mm thick, with no services running through. Your services should instead be run through the sub-floor. How can I maintain my polished concrete floor? 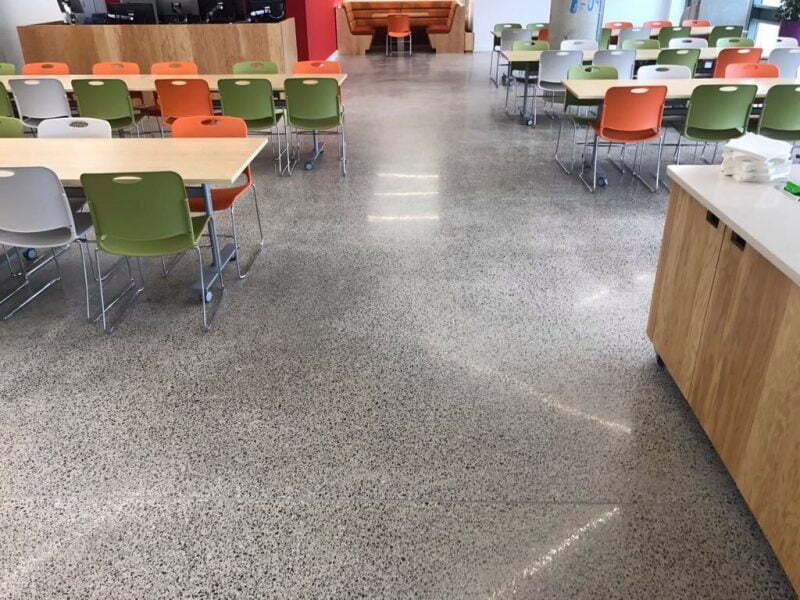 The beauty of a polished concrete floor is that it is virtually maintenance-free. We recommend sweeping or vacuuming on a regular basis. Concrete can be washed with a mild detergent and buffed dry with a white cloth to help keep its shine. Can I use bleach to clean my polished concrete floor? You should NEVER use bleach or any harsh chemicals on your polished concrete floor as this will etch the floor and leave marks that can only be removed by professionally re-honing the floor. Can I polish external concrete? Yes, outdoor concrete surfaces can also be polished to expose the aggregate. For optimum slip resistance, we would only bring it up to ‘grit 120’ – giving you a matte finish. How long does it take to restore a marble floor? It generally takes a full day to strip, clean, polish and seal a floor of up to 25 m2. Once we have finished, you can walk on it (albeit in socks) and you can allow normal traffic on the floor the following morning. How do I protect my floor when the Christmas party season begins? During busy periods, it’s more important than ever to keep to your daily maintenance routine of cleaning with a dry dust mop. Extra visitors mean more grit, more dirt and the chance of potentially damaging materials such as broken decorations. Make sure to sweep the floor regularly. Although your floor will withstand the battering, sharp edges could cut through the sealant, which may let liquid spill into it next time you mop or spill a drink. Stiletto heels may scratch the sealant on your floor, allowing liquid to seep through at a later date. Where possible, it’s a good idea to put down mats and rugs for protection. What type of finish is best on a marble floor? It all depends on the look you wish to achieve. Stone flooring that is honed has a smooth matte/satin finish. One benefit of a honed finish is that it does not show the pattern of wear as easily as a polished marble floor. The polished surface is highly reflective, if you want to achieve a more formal look then consider a polished finish. My limestone floor has been neglected for years. A friend told me it needed ‘Diamond Grinding’. Can that really help? When regular maintenance procedures are no longer adequate, complete restoration may be necessary. Problems like cracked, loose chipped tiles, deep staining, and incorrect maintenance can cause yellow marks and require intensive restoration. We would use diamond grinding discs during the restoration. This treatment allows the floor’s true beauty to be seen again. We may also use epoxy resins to help repair damaged and loose tiles, while stains may be removed using a poultice. Microtopping is an innovative material for renovating external or internal floors, walls and many types of surfaces, giving an exclusive and personalised touch. Is Microtopping easy to apply? Microtopping is simple and quick to apply. Being only 3 millimetres in depth, it gives your surroundings a whole new look without the need to remove an existing surface, if there is one. On average, how long does it take to create a Microtopping surface? It would take approximately one week to create 100 m2 of Microtopping surface. But application times always depend on the complexity and type of installation. In the case of an existing surface, it can require a few days more, necessitated by the assessment and preparation of the base. In addition to being an EC certified product, Microtopping has been subjected to multiple tests. Is a Microtopping floor safe? Yes. Strict tests demonstrate that, after the application and drying phases, Microtopping does not release substances into the air that are harmful for adults and children. Yes. Microtopping is a “green” system as the particular blend of liquid polymer and a cement mixture of which it is composed, respects the environment. It is also “smart”, as it meets modern requirements for adaptability, transformation and change. During installation, it reduces all dust to a minimum, plaster flakes, rubble and all the other clutter from normally bothersome restoration works. Can Microtopping be applied to any kind of surface? Microtopping can be applied both on level surfaces and in 3D, vertically and horizontally, indoors and outdoors and even on objects such as furniture. Due to its adhesive properties, Microtopping can cover virtually any type of solid surface. Can Microtopping be applied to existing surfaces? Microtopping is perfect for new buildings, as well as the renewal of existing surfaces. Microtopping has the special ability to be used over old wooden, ceramic and concrete floors without any need for removal. Can I obtain a continuous surface area without joints with Microtopping? Microtopping was created to respond to the needs of those who do not like joints. Applicable both vertically and horizontally, it bestows maximum continuity to these areas or surfaces. The installer will, however, assess whether it would be appropriate to respect existing joints. Can Microtopping be used in external areas? Microtopping is ideal for external applications such as terraces, footpaths, swimming pool decks, porches and walls. Microtopping is provided with good protection from water penetration, climatic stress, de-icing salts and UV rays. Can I apply Microtopping in my kitchen? Yes, it can be used on any type of flooring or surface as long as it is treated appropriately. It is not, however, recommended to place very hot objects on it, use the counter for chopping or leave aggressive substances on the surfaces, such as lemon juice or vinegar. Can I apply Microtopping in my bathroom? Certainly. Microtopping is suitable for this type of application because it provides good protection against water penetration. In the restoration or refurbishment of existing surfaces, an appropriate assessment is required by the installer as well as adequate preparation of the base. Is Microtopping recommended for busy and/or commercial areas (showrooms, shopping centres, hotels, businesses)? Microtopping is perfect in commercial applications. It displays style, class and elegance while also being a very low maintenance option. I have underfloor heating. Can I use Microtopping? Microtopping has perfect adhesion even on surfaces with underfloor heating systems. It is fundamental to choose a suitable support for the heating system installed. Microtopping has a heat conductivity value of λ =0.46. What finishes and effects can be created with Microtopping? It is possible to choose between SHINY, OPAQUE, SATIN or NATURAL effects for Microtopping surfaces. Based on the type of project – interior or exterior – the technical specifications required and the final effect desired, it will be the task of the installer to advise on the most suitable protection. It is possible to obtain many combinations of colours and texture with Microtopping. The intensity and shade of colour will vary, depending on the quantity of dye used. Indeed, the colour table only offers a rough guide. It will be the task of the installer to provide samples based on the customer’s request. It is also possible to create effects such as polished, silky, cloudy and acid stain as well as providing shades and decorative inserts to form unique, personalised finishes with great aesthetic impact and elegance. Can I change the colour of the surfaces once created? Certainly. Just sand/roughen the surface and reapply Microtopping. This procedure is especially useful for the restoration and renewal of surfaces such as, for example, the change of use of a commercial premises. Microtopping has excellent resistance and slip resistance. It is suitable for use as floor and wall cladding and its specifications are similar to those of a top of the range wooden floor. However, Microtopping is not comparable with ceramic surfaces, which is a very different material and involves very different production processes. How can a perfect appearance be maintained over time? before carrying out painting, electrical jobs, plumbing, moving and handling furniture, protect the floor with cardboard, woollen blankets and nylon sheets. How do you keep a Microtopping surface clean? Microtopping has a very simple maintenance and cleaning plan. A damp cloth is sufficient to clean the surfaces, with the addition of a little neutral detergent for floors. It is recommended to periodically treat the surface with protective, superficial products based on self-polishing waxes dispersed in water or beeswax. Detergents based on soap, acid, ammonia, chlorine or any abrasive detergent products are absolutely prohibited. It is recommended to only use NON-AGGRESSIVE, pH neutral detergents. Can Microtopping surfaces be scratched? Microtopping, like even the most resistant surfaces, can be scratched. As with all surfaces, these scratches will be most apparent on very shiny and smooth surfaces. For this reason, we recommend an opaque finish. If it is required to get rid of scratches, maintenance can be carried out, as with wooden surfaces. Can accidental falls of heavy objects ruin the coating? Yes. Heavy or sharp objects can mark Microtopping surfaces. If water, oil or other substances are spilt on it, will Microtopping stain? Microtopping has a very wide range of protection and the choice of the right protection depends on the requirements of the end customer. There are solvent and water-based products which can protect your surface. Even though the resin treatment protects the flooring from rapid penetration of accidentally spilled liquids, it is well to remember that all liquid substances, especially those most used in the domestic environment such as wine, oils, vinegar and coffee, must be eliminated quickly from all Microtopping surfaces before they can penetrate to any depth. Dropped ice cream has particularly penetrative qualities. Can the colour and appearance of a Microtopping surface undergo changes over time? The colours used have the maximum resistance to UV rays and the protective treatments are not subject to yellowing. As with all types of materials (see, for example, car paintwork), after constant exposure to the light of the sun and moon, slight fading is possible. Will my floor (marble, travertine, limestone, terrazzo, granite) need honing? Honing isn’t usually necessary. However, if your floor very scratched, this will remedy the problem. Honing is the process of smoothing the stone with the use of abrasives. Although not as aggressive as grinding, it does require the use of water, and can be quite messy. Honing is performed to remove scratches, but will not remove lippage (uneven tiles). It can, however, round the edge of the stone, giving it a smoother edge. The honing process is achieved with the use of diamond abrasives. Honing can leave a stone floor with very little shine, although some stones will acquire a satin-like lustre at very high hones. Can I polish an existing concrete floor? For existing concrete floors, the final appearance depends on how the floor was originally composed, the quality of the cement used, the type and amount of aggregates, and how much of the aggregates it is possible to expose after grinding.